I have sore knees that also crunch when I walk due to being overweight and having flat feet. I have seen a Pilates machine for sale and would like to give it a go but am not sure if I will be able to use it. I have many clients who use the Pilates Equipment who have had knee replacements and also have arthritis joint pain in the knees. We have had much success using the Reformer and Wunda Chair footwork exercises. The good thing about using the Pilates Reformer or the Wunda Chair is that it is low impact and low stress on the joints, which makes it about as safe as doing water workouts on the joints. Most of the leg strengthening exercises can be done lying with the use of spring tension. Spring resistance helps to stretch and strengthen the muscles which support the knee joint at the same time without putting undo pressure right in the joint. I too have flat feet and the footwork positions on the Reformer and Wunda Chair help to strengthen and correct my feet while correcting the posture of my legs all the way up into the hips. Sometimes the footbar can be a little hard. 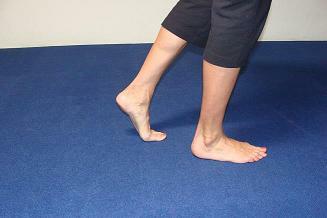 You can wrap it or cushion it as much as you need to make it comfortable for you to do the footwork. I recently wrote a Foot Ebook that has some wonderful exercises to stretch and strengthen your feet including those that can help with flat feet or fallen arches. Check out the new Foot Ebook: Treat Your Feet, by going here. The great thing about the Reformer is...you are working on your feet, knee, and leg strengthening all at the same time! I think you will be very pleasantly surprised at how much better your knees will feel as you can safely strengthen the muscles that support the knee joint using the Pilates equipment. It's a great machine and if you can find one at a good price go for it! Check out my Reformer upper and lower body workouts by clicking here. Avoid doing the feet in straps exercises on the Reformer until your knees are feeling better. Check out the Pilates Chair Workout here. I agree with Jennifer. I have found that there is nothing like the reformer and the Wunda Chair for getting your feet strong and flexible. This, in turn, will help your leg strength and posture. Those knees should be feeling better soon!